A wedding ring, wedding banquet, bridal package, wedding photography, and the list goes on. These are just some of the few things that you’ll have to consider before spending eternity with your other half. Having pre-wedding jitters already? Worrying about the costs? Just like everyone, you’ll definitely want to have the best wedding considering this is one of the most significant milestones in adulthood. It is a consummation of the perfect union and as such, the perfect reason to celebrate it in style. This is also a day to bring both your families together as you enter a new phase of your life. As such, from planning to execution, everything has to be exquisitely covered. Thankfully, we have just the right solution for you. Without a doubt, weddings are an expensive affair. They can range from S$27,000 (lower range), S$39,500 (middle range) and an upper range of S$52,000. On top of this, the wedding banquet itself will set you back by another $30,000 – $50,000, for a total of 300 guests. Of course, if you have fewer guests, you can expect to pay less. Feeling bogged down and thinking of shelving your wedding plans for another year? Don’t. We might just have the right solution for you. This is where Horison Credit’s wedding and marriage loans come into play. Why Take A Wedding Loan? You might currently be facing pressing financial issues in your life including your mortgage, car loan, home renovation loans, among many other huge bills. With so many loans to juggle, you might not have the requisite funds available to cover the cost of your entire wedding. A wedding loan is just what you need to ensure that you have enough to cover for your pre-existing loans and any other emergencies that might arise. With our personalised wedding loans, we hope to see more couples hold their dream nuptials by facilitating the financing to bring your dream wedding to life. 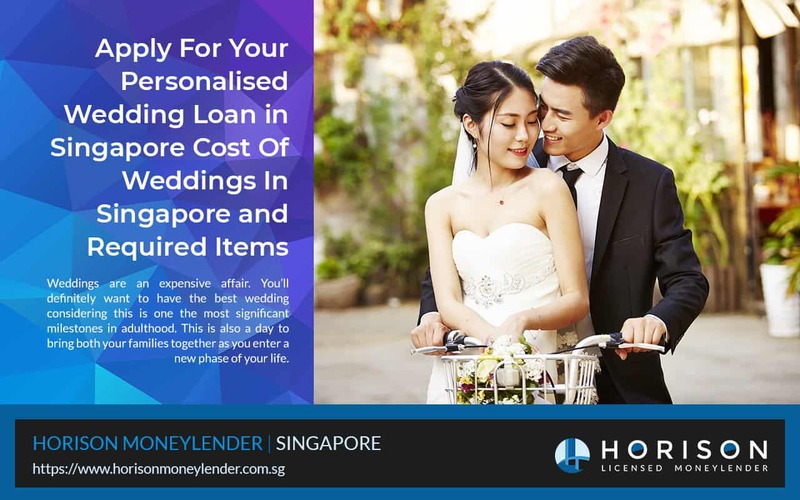 We are committed to ensuring that your special day is truly memorable and this is why at Horison Credit, we’ll have the wedding loan tailored to suit your needs. By working closely with you and your spouse to better ascertain your situation, we’ll design a wedding loan to suit your needs. With our wedding loan, you’ll be able to use it to sort out expenses including wedding bands, photography, videography, bridal packages and wedding packages. Compared to getting credit card loans, the best part of applying for a wedding loan with us is that we do not require you to have a minimum annual salary. As long as you can prove that you have a stable source of income each month, you’ll more or less be approved for the loan. In addition to this, we understand that you may be juggling quite a few loans at the same time. This is why our wedding loans have a flexible repayment scheme and are prepared to suit your financial situation, meaning that you won’t find yourself struggling with repayments.  Our loan assistants will work with you to ensure that the loan package sits well with your needs. Our fast approval process and high approval rates also ensures that you’ll be able to get the cash you require, fast. 1. Dowry: This is an integral part of marriage ceremonies in most communities. To get the bride’s family’s blessings, make sure you pay this in advance as a show of respect for their culture. 2. Wedding bands: As an affirmation of your love for one another, these will cost you anything from $2,000 to $5,000. 3. Wedding banquet: This is among the highlight of any wedding and in Singapore, this can set you back $30,000 and above. 4. Bridal package: This covers for the pre-wedding shoot, makeup, hairdo and wedding gown for the bride. It also covers the suit of the groom. You should set aside at least $3,500 for this. 5. Wedding Solemnisation: This will cost around $3,000 – $5,000. It covers the rental for the location and the reception thereafter. 6. Wedding photography and videography: This is a must for all weddings. You would need to have a professional photographer/videographer to capture this once in a lifetime celebration and moment. You will have to put aside an estimated $2,000 – $4,000 for this. Do note that these are just estimated costs and and the actual cost may differ. 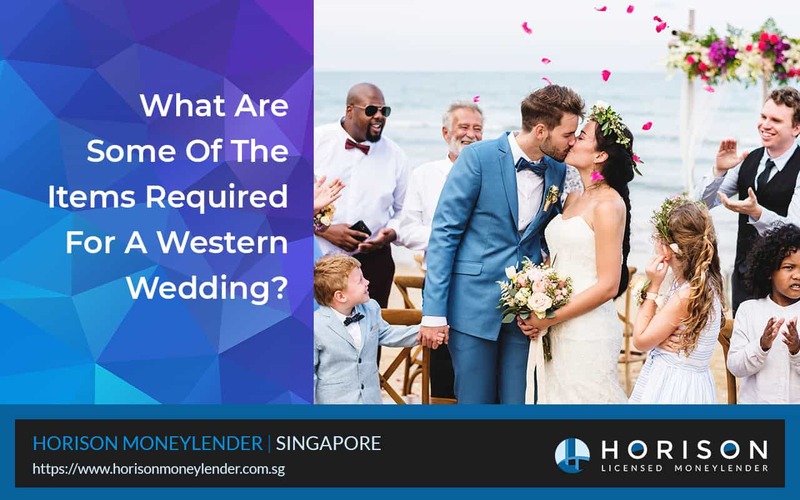 There may also be additional costs involved as these are just some of the very basic items required for a western wedding. Since the ancient times, Chinese weddings have always been elaborate community affairs where no expense and efforts are spared to make them successful. The wedding ceremony is a culmination of other elaborate rites where the entire family comes together with the community to honor age old traditions. An ordinary Chinese wedding costs at least $20,000 but you might expect to pay more for the elegance and glamour that comes with Chinese rites. 1. Proposal & Betrothal, Guo Da Li (过大礼): This is a crucial part of the Chinese wedding in Singapore and it involves presentation of gifts by the groom’s family. These gifts should represent well wishes for fertility and prosperity. Different dialect groups have their own unique betrothal baskets, which you can easily buy from wedding shops in the city. This usually consists of red packets for parents ($2,000), wedding biscuits and cakes ($600), and 4 gold ($3,700), bringing the total to $6,300 which usually comes out of the groom’s pocket. 2. Red packets: On the day of the wedding, you’ll also have to factor in the cost of giving out red packets for the gatecrashers, helpers and younger relatives. You can expect to spend up to $2,000 for this. 3. Wedding bands: These will cost you anything from $2,000 to $5,000. 4. Wedding photography and videography: This is a must for all weddings. You would need to have a professional photographer/videographer to capture this once in a lifetime celebration and moment. You will have to put aside an estimated $2,000 – $4,000 for this. 5. Wedding banquet: This is going to take up the bulk of the cost as friends and family of the bride and groom will gather together at a hotel (usually) for a lavish eight to ten course dinner, sometimes lunch. There will be speeches from parents, the maid of honour, friends and the bride and groom themselves. There will also usually be a cake cutting ceremony and a toast for to celebrate the joyous occasion. This will cost anywhere between $30,000 to $50,000. That being said, most of the money can be recovered through the red packets from guests. 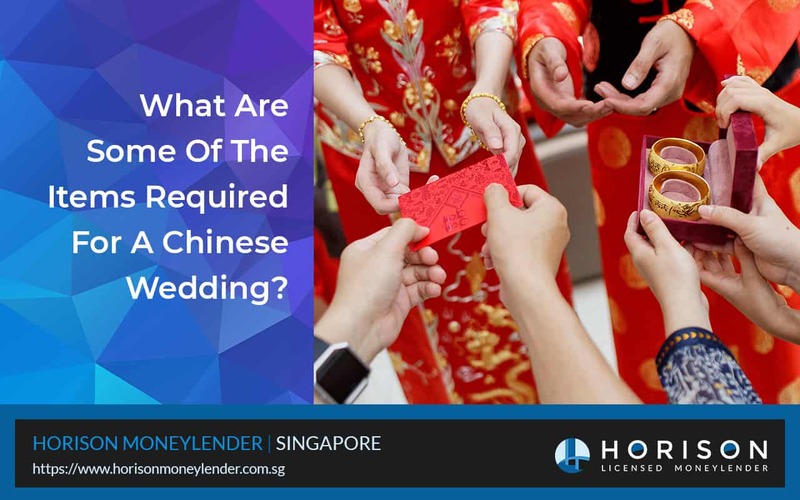 If you are planning a Chinese wedding in Singapore, you have to be ready to bring to life these age old traditions and customs. They will cost a lot but you will have the crucial blessings of the family and community as you start your marriage life. If you are planning a Malay wedding in Singapore, you have to be aware of the deep cultural significance this ceremony has. While weddings in every community are considered important, Malay weddings are more entrenched in the traditions and customs of the community. This is an important community event that needs to be celebrated in style. It is not a family affair alone but an elaborate occasion involving the ‘gotong-royong’ kampung spirit where the whole community comes together to celebrate your nuptials. Of course, all weddings require a lot of effort but for Malay weddings, you need even more. These are elaborate events that rope in everyone in the community. They are not just focused on the nuptials but instead, the couple goes through a cultural journey that was well established by the forefathers. From Merisik stage where a relative is sent to spy on the potential bride, Wedding Ceremony (Majlis Persandingan) to homecoming (Bertandang), there is so much that goes on in Malay weddings. This is without doubt going to be an expensive affair but with this financial product, now you can have that dream Malay wedding. With this wedding loan, you will be able to participate in every rite in a stylish manner. A fantastic wedding not only impresses your bride’s family but also earns you the much needed blessings from the family and entire community. A glamorous Malay wedding is the first step in the long and joyous journey of marriage. By immersing yourself into the Malay wedding rites, you will also get a chance to learn more about this culture. 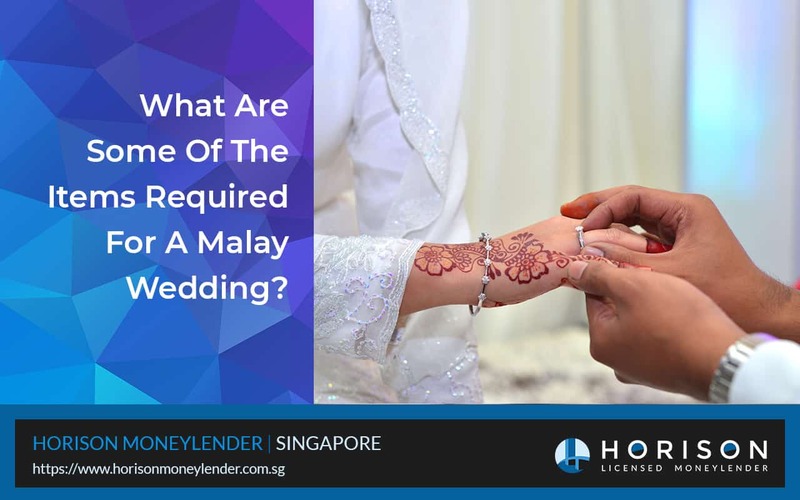 Now that you appreciate the importance of every rite in the elaborate Malay wedding, it’s time to find out what you’ll be required to prepare and buy during this wedding. 1. Merisik gifts: These are presented to the bride’s family during the initial stages of a proposal. They range from handbags, food, and jewelry and a present of Duit Hantaran of around $8,000 to $15,000. 2. Mmas kahwin (dowry): This is paid during the bertunang process (engagement) and before solemnization. 3. Marriage prep course: A certificate is issued after this compulsory step in a Singapore Malay wedding and you should give something to the teacher. 4. Marriage registration: A registration certificate is provided after a meeting with a Registry of Muslim Marriages (ROMM) official. 5. Betrothal Gifts (Hantaran): Both sides of the family come with gifts during the solemnization ceremony and they range from formal Malay attire, electronics among others. 6. Sirih Dara and Mahar: This is the most important gift for a Malay wedding. The Betel Leaves of Virginity is a gift given by the groom to the bride to signify she is a virgin. Mahar is a money gift symbolizing the value of the union. Of course you have to cater for the food, entertainment among other things during a Malay wedding. Talk to us for a custom wedding loan to make your special day truly memorable. We understand that different weddings have different requirements and that ultimately, every wedding is unique in their own ways. With our personalised wedding loans, it is now possible for you to have the wedding of your dreams, without having to worry about the costs. Whatever wedding ideas that you have in mind, feel free to share them with us and we’ll have a wedding loan package to cater to your needs. Get in touch with us today to find out more and make your dream wedding a reality!